My earliest memory of loving birds occurred when, as a child, a myna bird visited our family property for several months. Recently, while going through an old desk drawer, my mother found another example of my love for birds, a letter I wrote to Santa at the age of five. And the very first request… a parrot! On my sixth birthday my father presented me with three beautiful goldfinches. From that moment on an avian companionship was born that has continued to this day. This companionship has brought decades of joy, adventure, knowledge, and fun. 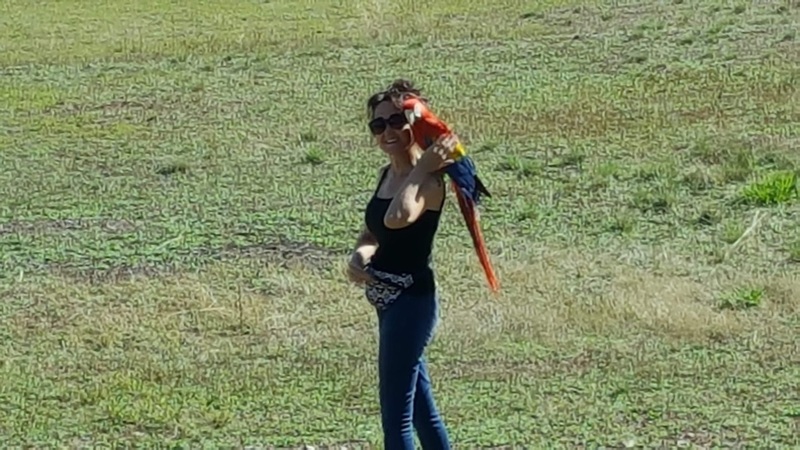 It is this gift of birds that I feel compelled to share with the world through Sacred Scarlets and my beautiful Scarlet Macaw companions, Sedona and Jerome . Kelley was born in Tucson AZ. At the age of eight her family relocated to the historic Valley Forge region of Southeastern Pennsylvania. She graduated from Philadelphia College of Art with a BFA in Photography. Her birds were part of her college life, a time when so often they are left behind with family. In 1995 Kelley moved to Milan, Italy to pursue her career in photography. She brought along her sweet cockatiel Rex to Italy. Kelley’s creative skills helped her obtain clients such Conde Naste and Gianmaria Buccellati. After returning to the states in 1990 Kelley became a gallery owner exhibiting and promoting local and nationally known artists and craftsmen to an affluent suburban clientele. During this time Kelley adopted several larger parrots while working independently to foster, rescue, rehab and re-home numerous others. In 2000 Kelley returned to the desert where she was born. 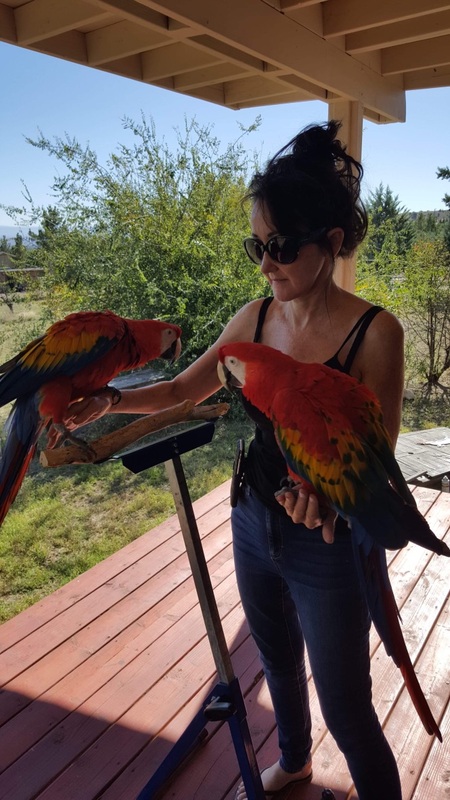 It was in this desert where Kelley began to pursue her interest in a recent realization …that parrots had once lived in the Sky Islands region of southeastern Arizona, southwestern New Mexico, and northwestern Mexico! Returning to Tucson to promote the Thick-billed parrot’s survival Kelley began to study and intensely research another parrot, the Scarlet Macaw which has a long and extensive history that is often overlooked in its significance in the native cultures of the Desert Southwest. For many years Kelley visited parrot sites in Mexico, volunteered with the Arizona-Sonoran Desert Museum Raptor Free-Flight Program, and worked with parrot rescue organizations in Arizona. In 2010 Kelley founded Sacred Scarlets, now a 501(c)(3) organization. The organization is growing every day!